11/22/17: Chairman Meow dispenses his infinite wisdom to the masses, including his recent brilliant posts about a seriously dumb helmet invention, and why cats love boxes. He also fights capitalism with subversive coupons that take money from greedy corporations like weight watchers found here. 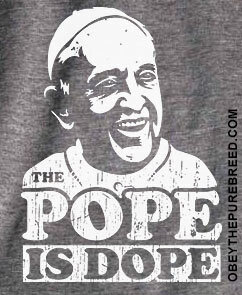 He changes these coupons every month, so please enjouy the Pope Francis swag, and read our new t-shirt blog, and come back again to check our monthly deals!